I decided to resurrect my old Amstrad CPC 464 and CPC 6128 computers. As I suspected, the disk drives were no longer working. After much internet research and buying supplies, I set to work. 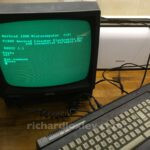 This entry was posted in Retro computing and tagged retro on 1 February 2017 by Richard.